Now, there is nobody who would deny that knowledge is important. Nobody. We all recognize that it has a central role. However, it is clear that, with an abundance of knowledge now available to students at their fingertips via the internet, we must shift teaching practices from a model of knowledge transmission to one of developing certain dispositions that transcend subject areas and other boundaries, just like what a balloon full of hot air does. We know that didactic teaching that sees students as submissive receptacles for knowledge passed-down from on high by a coercive authority figure is pretty much useless for developing students who can think at all. It was W B Yeats who famously said something about buckets. Or perhaps that was Einstein. Or maybe that was the one about the fish and the bicycle or the fish and the tree. It doesn’t matter. A truth is a truth even if the quote is not. But nobody is against explicit teaching in its appropriate place. Let me make that clear. If we don’t teach children how to think then they won’t be able to process thoughts. We must also teach them how to analyse the process of their own thinking. This also requires thinking. Then again, they must develop an evaluatory capacity for monitoring the analysis of their own thinking. This requires yet more thought. Thought about in this way, it is absolutely clear that thinking should be at the heart of the curriculum and, if we wish to develop a future capacity for thinking so that students develop in to actively thinking, thoughtful, sentient citizens who think lots then the process of actionizing thinkiness should be at the very heart of our pedagogy. This powerful thinking tool can be used for making any kind of decision, from whether to have scrambled eggs for breakfast to whether to invade Iraq. Moreover, meta-thinking can be invoked by asking students to think about each others’ thinking processes which are now visible! Knowledge is important. It is crucial. But in the future, our students will have computers and the internet to know stuff for them. We need to focus on enabling them to think. 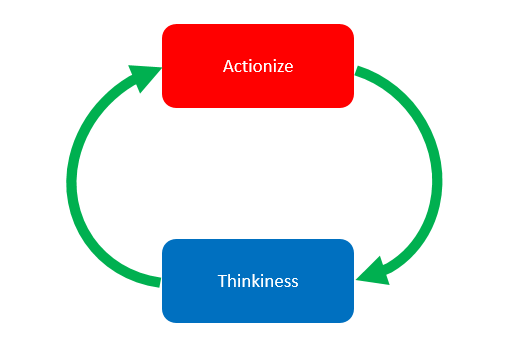 Building lessons around the imperative to actionize thinkiness will ensure that they think lots.